This activity was something that came up during curriculum planning with another teacher in my corporation. We wanted to come up with a visual for our students to help them better understand what culture is and how our cultures define us. My favorite thing about teaching a 9 week exploratory course was that we got to dive into topics like this one. I started by asking students to define the word culture. We listed topics on the board such as ethnicity, religion, foods, clothing, language, etc. After we had a good working definition, each student received a handout that had a large pair of "Cultural Lenses" on it. 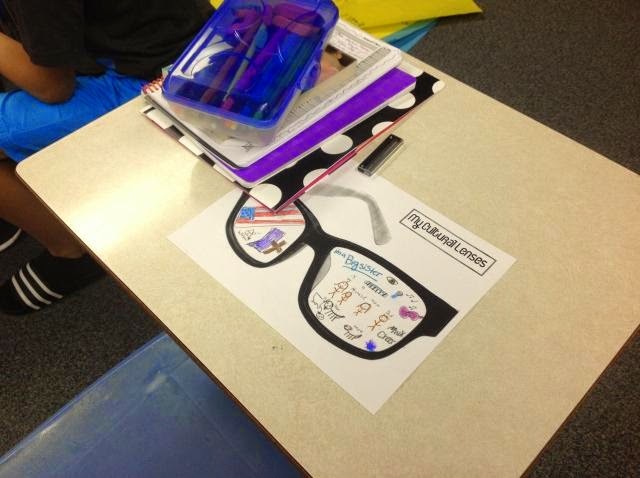 We discussed how our culture is similar to a pair of glasses we put on each day when we wake up. The rest of the day, everything we see, everyone we talk to, and every interaction we have is colored by the way we were raised and our definition of "normal." So, inside their "Gafas de Cultura" students tried to depict their own personal culture, including each of the categories we listed on the board. They could use a mixture of pictures and words to more accurately define what makes them unique and what affects the way they view the world around them. How do you discuss topics such as stereotyping, racism and cultural awareness in your language classroom? Do your students come from similar or diverse cultural backgrounds? I'd love to hear about your experiences!